Comprehensive Facial Rejuvenation is a term defining the process of combining surgical and non-surgical procedures that offer a balanced and refreshed appearance to the face. Addressing all aspects of facial aging, Dr. Richard H. Bensimon works closely with his patients to choose the best combination of procedures and products that will offer a natural and long lasting result. A personalized treatment plan may include surgery, Botox and dermal fillers, fat injection or a BensiPeel™ and BensiSkin™ to vastly improve the” loss of structure”, “loss of volume” and “textural” aging changes of the face. 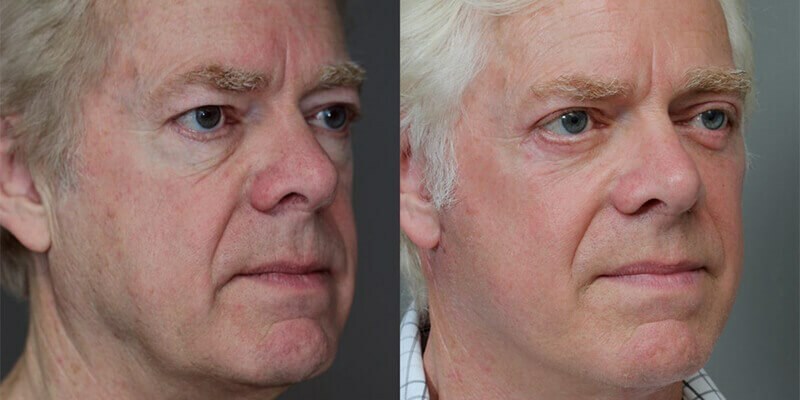 In this example, a male patient has had a facelift, upper and lower eyelid blepharoplasty and a lower eyelid BensiPeel™. Facelift surgery also known as a Rhytidectomy, helps improve the appearance of aging changes that result from a “loss of structure”. This surgery repositions the tissues up into the mid-face, creating a more youthful and lighter look. Many facelift techniques are performed as a “skin only” dissection that relies on the skin for the lifting improvement but will result in a temporary and incomplete correction with the skin stretching as it relaxes overtime. A “deep plane facelift” is a technique utilized by Dr. Bensimon and other skilled surgeons that focus on the deeper structures of the face for the most natural and longest lasting correction. A blepharoplasty is a procedure designed to restore the appearance of the youthful eye. Excess skin is removed in the upper eye to create a crisp fold without changing the natural shape of the eye. Eyelid surgery on the lower lids may involve removing fat to reduce bags or adding fat to improve a sunken, hollow look. Dr. Bensimon has over 20 years of fat injecting and micro sculpting experience. Using the Bensimon Micro Sculptor™ cannula, he ensures that the quality of the harvested fat is superior, smooth and well suited to the eye area. A BensiPeel™ is a revolutionary advance in facial resurfacing, creating a dramatic change to the skin with improvements to deep wrinkles, pigmentation (dark spots) and sun damage. The skin quality and health is improved because damaged skin is eliminated to allow the growth of new skin. Dr. Bensimon, in collaboration with world-renowned plastic surgeons, has developed this revolutionary peel which has heralded international acclaim due the stimulation of collagen and elastin resulting in superior skin quality and longevity of results. Bensimon Center patients who also use the BensiSkin™ clinical skincare line report they are easily able to maintain a rejuvenated, youthful appearance by protecting their skin and following a healthy lifestyle. Are you ready for transformation so you can look the best version of yourself? Call the Bensimon Center at 503.506.0995 or request a consultation.